At 3PL Center, we believe that every e-commerce business is unique, and has the potential to succeed online. Let’s say you own a beautifully designed e-commerce website, you know the importance of providing first-class customer service, and you know that you need to conduct effective online marketing to spread awareness of your e-commerce business. However, that’s not all. If you are seeking ways to improve your e-commerce business, you will need a high quality fulfillment provider too. With our stellar e-commerce fulfillment solutions, you can tap on our expertise to bring your business to the next level. The process of receiving orders from a web store or online shopping cart, as well as picking, packing, and shipping them to customers across the globe is called e-commerce fulfillment. Since this type of fulfillment takes place online, it differs other forms of fulfillment such as marketing and collateral fulfillment (orders will be shipped to internal business locations or employees), retail fulfillment (orders will be shipped directly to business retail locations), and other business to business fulfillment services (orders are delivered to businesses; not consumers). Why Should You Choose 3PL Center for E-Commerce Fulfillment? 3PL Center was founded more than six years ago, and we have a combined experience of more than 45 years across the team. Since our inception, we have been providing reliable, top-notch service to all our clients. The e-commerce fulfillment niche can be highly competitive, but we provide a distinguished level of support that allows us to come out on top. 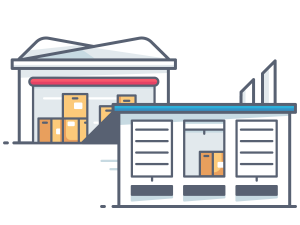 What’s more, we provide both fulfillment services and inventory storage to e-commerce retailers of all sizes and types; we serve all our clients with the same level of dedication and passion for your e-commerce fulfillment needs. The 3PL team will work seamlessly with your e-commerce store by facilitating real-time communications back to your customers, providing real-time inventory status updates, displaying real-time shipping rates, automating orders, and more. Whether you are entering the e-commerce arena as a new sales channel for your unique product(s) or need to ship 3,000 orders daily, you can rest assured that 3PL Center has the resources and knowledge to help you grow your online brand. We can help expedite shipments so that your buyers receive their orders sooner. This gives you better reviews and more word-of-mouth referrals! Working with us for your e-commerce fulfillment needs is extremely easy and you can enjoy peace of mind. We have a stellar customer service team working around the clock. You can reach us at any time if you require assistance. Ready to Get Started with E-Commerce Fulfillment? If you are planning to try an e-commerce fulfillment service, 3PL Center is the partner you can trust to do a stellar job. Email us at sales@3plcenter.com or give us a call at 732-391-2500 today!